The open-source video transcoder HandBrake 1.0.7 was released hours ago. It’s official PPA now provides the latest packages for Ubuntu 17.04 Zesty. By releasing version 1.0.4, 1.0.5, and 1.0.6 within a few hours, the developer finally announced HandBrake 1.0.7 to supersede previous releases. 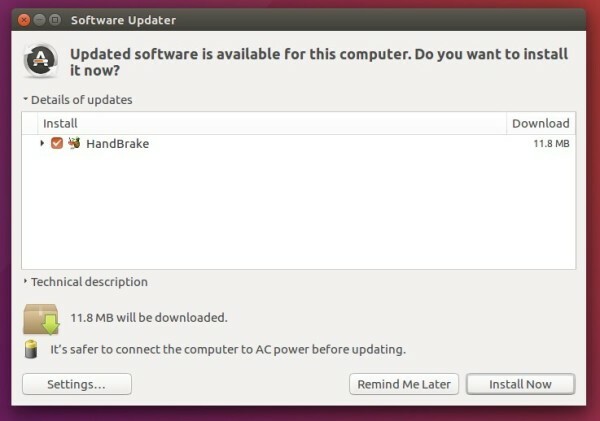 The official HandBrake PPA provides the new 1.0.4 release at the moment for Ubuntu 14.04, Ubuntu 16.04, Ubuntu 16.10, Ubuntu 17.04, and derivatives, e.g., Linux Mint 17, 18, and Elementary OS Loki. Very grateful for Handbrake and also the PPA. It’s a pity that the PPA still is on Handbrake 1.0.4 whereas the developer has published 1.0.7 already. when 1.0.7 will be available in the ppa ? also why the macOS version is simpler than the ubuntu one ? First, thanks for making this post and how-to available. Could you help this noob out? It has to be something simple, but Linux is new to me and I do not get what is happening with the install. I have used Handbrake on macOS and now am trying to get the command line version working on an Ubuntu Server 17.04. It’s case sensitive, try running HandBrakeCLI, or use man HandBrakeCLI to get help. Please disregard the post I just made. I took a fresh look at the instructions on the official Handbrake website and found capitalization turns out to be critical. Commands do work with “HandBrakeCLI” and do not with “handbrakecli”. Now everything works for me as expected. And, I learned about using -i with the locate command to avoid capitalization problems. That probably should be pointed out for dummies like me.